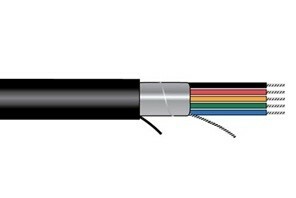 Xtra-Guard® 3 cable is a direct burial cable - no conduit needed. It has 6 times the water resistance of PVC and features a specially formulated polyethylene jacket for outstanding service life and ultraviolet light stability in all jacket colors. Xtra-Guard® 3 is resistant to the effects of weathering, moisture, and UV aging without the costly use of conduit. Supra-Shield® provides exceptional protection against conducted or electrical noise in high- and low- frequency environments where EMI interference is pervasive. Tinned Copper Conductors. PVC Insulation. PE Jacket.